In chapter nine of their book Short Term Trading Strategies That Work, Larry Connors and Cesar Alvarez refer to Relative Strength Index (RSI) as “The Holy Grail of Indicators.” While I don’t like the implication that there is a “Holy Grail” in trading other than hard work and studying, Connors and Alvarez to provide some interesting research to back up their claim. The standard period that is commonly used for the RSI indicator is 14, but Connors and Alvarez argue that there is no statistical evidence that 14 is the optimal period. Their testing has revealed that a period of 2 will provide the best returns. Connors and Alvarez set out to test their theory over the time period from January 1, 1995 through December 31, 2007. During this time, they calculated that the average stock that was above its 200 day simple moving average (SMA) gained 0.05% over a 1-day period, 0.1% over a 2-day period, and 0.25% over a 3 day period. They used these numbers as a benchmark for their 2-period RSI indicator to compete against. Focusing on the oversold side, stocks that had an RSI below 10 were able to outperform each of the three benchmarks. They recorded returns of 0.13% over a 1-day period, 0.31% over a 2-day period, and 0.74% over a 1-week period. Not surprisingly, when they lowered the oversold requirement to an RSI below 5, the performance numbers improved even more. The numbers then improved again when they lowered the RSI requirement to 2, and once again when they lowered the RSI requirement to 1. When the RSI requirement was lowered all the way down to one, the RSI indicator recorded returns of 0.3% for a 1-day period, 0.66% for a 2-day period, and 1.18% for a 1-week period. 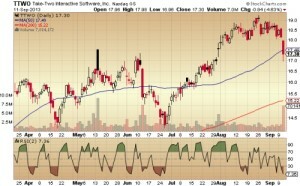 This indicates that the lower the RSI, the more the stock was likely to rebound. Clearly, the 2 period RSI indicator can perform extremely well on short term trades. My early stock market training was a combination of William O’Neil’s CANSLIM method and the trend following approach promoted by Michael Covel. Because of that, I have always been against the concept of an overbought or oversold indicator. Following with my trend following and CANSLIM training, I believe that the stocks with the strongest relative strength are most likely to continue moving higher. What I was missing, was the idea that short term overbought and oversold conditions can exist within long term trends. That means that overbought/oversold indicators and trend following philosophies do not necessarily have to be mutually exclusive. 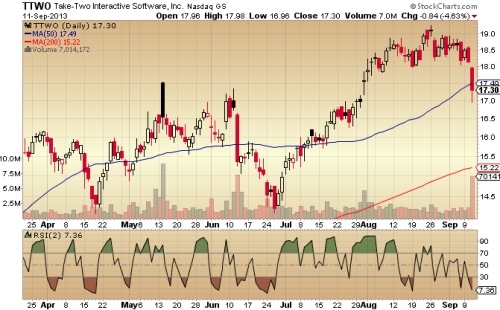 One interesting example of using RSI to identify short-term oversold opportunities would be Take Two Interactive Software (TTWO), which took a big hit in today’s trading. My CANSLIM and Trend Following background tells me to avoid stocks that are taking big hits and crashing below their 50-day moving average on big volume, but that is a longer-term outlook. It would not be unreasonable for TTWO to bounce back over the next few days and then head further south. 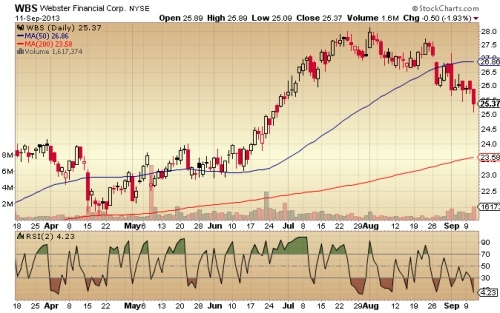 The same case can be made for Webster Financial Corp (WBS) , which has recently lost its 50-day line and has been trending down for the past few weeks. 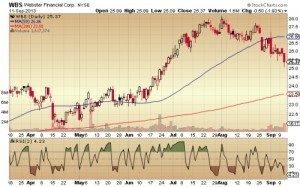 While taking a long term position in this stock might not make much sense to a mid- or long-term trend follower, the stock’s 2-period RSI of 4.23 indicates that it is likely to see a small bounce over the next few days. The RSI entry rules show that WBS is due for a correction in the short term. It is important to keep in mind that the profitable returns that Connors and Alvarez were able to produce in their returns came from including EVERY instance of a stock falling into oversold territory. They were not picking and choosing their favorite companies. Therefore, in order for us to use this idea, we will have to build it into a system that will be able to trade every signal generated, not just the ones we like best. This will ensure that we don’t allow our own personal biases to interfere with the system’s success. It is also important to realize that this 2-period RSI concept is simply an entry signal. In order to develop it into a trading system, we will need to add an exit signals, position sizing, and risk management. This will require extensive testing and analysis, but it does appear that it would be possible to build a profitable short-term trading system using the 2-period RSI as an entry signal. Thank for the posts on RSI(2). Just wanted to let you know someone is reading. I read about this system four or five years ago, but never used it. I may try it on a smaller scale because it is interesting. Thanks for letting us know. I’m glad that you’re finding our systems ideas useful. I have used a rsi time period of 2 and a rsi value below 1 on a daily time frame to enter long stock positions looking for a 10% rise in the price while also buying close to the money put options in nearby months to protect my downside. I used heavily traded stocks that exhibited enough volatility to justify trading them starting in 1999. Before the tech crash I averaged a 1% return per week on my trading capital. I averaged 4 trades per week where I exited my position on either a 10% rise in price or before my option position expired. 3 out of four trades ended up being winners. I put 2% of my trading capital to work in each trade. I was very leary of a long losing streak and wanted to put chance of ruin as low as possible. I used a 200 day moving average that had to have a positive slope to filter trade candidates and the problem with using this to filter trades is that after the crash the number of stocks left to trade fell so far off that even though I didn’t start losing money I stopped making enough to cover my monthly expenses that I had to return to a regular fulltime job by the fall of 2000. I used a similar system only using long call positions for a 14 month period ending in August 2007 to return 87% on my trading capital. The problem for me is the time commitment to finding trades and working fulltime and trying to have a family life do not work. If you are able to sit in front of a computer all day while the market is open this type of trading is very successful during a bull market but trading opportunities dry up to nothing during bear markets. The secret is to make enough during the good times to carry you through the dry times and I haven’t been able to do that yet with the amount I have to invest. That’s excellent feedback. I appreciate you sharing your general trading setup. Have you considered taking short signals as well? It stands to reason that a short strategy would exhibit much stronger moves… and buying calls is always cheaper than buying puts. I would expect that type of strategy to make more than long only.